The Metropolitan Museum of Art in New York City embodies the dream of community leaders and artists who wanted to make art and art education accessible to the American public. 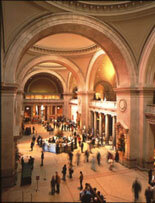 The Metropolitan Museum of Art has endeavored to fulfill the vision of its founders since its inception in 1870. Known as The Met, the museum is one of the largest art galleries in the world. The institution’s main collection is housed in a Greek Revival style building located on the east side of Central Park in an area known as Manhattan’s Museum Mile. More than 5 million guests visit the exhibits each year, which places the museum second only to the Louvre in Paris. The Met’s extraordinary collection encompasses more than 2 million individual works of art, including 24 rooms that illustrate daily life with period furnishings. The objects range from classical antiquity and Ancient Egypt to modern, contemporary periods. The pieces on display, which come from across the globe, represent a variety of artistic masters through the ages. In addition to works from primeval Egypt, Greece and Rome, exhibits include Islamic and Byzantine artifacts and an extensive collection of African, Asian and Oceanic artwork. There is a comprehensive assortment of works by renowned American artists and European masters. In addition to its impressive collection of paintings, sculptures and tapestries, The Met has a broad repository of costumes, musical instruments, armor and weapons. Visitors can enjoy the spectacular views of Central Park and the cityscape while relaxing in the Met’s rooftop garden and café.